F Brett Breitkreuz (Kelowna, Edmonton, Vancouver, 2006-10) has signed a one-year extension with Löwen Frankfurt (Germany, DEL2). This season, in 50 games, he had 17 goals and 16 assists. . . .
F Richard Mueller (Brandon, Saskatoon, Calgary, 1998-2003) has signed a two-year contract with Riessersee Garmisch-Partenkirchen (Germany, DEL2). This season, he had 28 goals and 17 assists in 45 games with Löwen Frankfurt (Germany, DEL2). The WHL’s championship final will feature the Regina Pats, who won the Eastern Conference title, versus the Seattle Thunderbirds, the champions of the Western Conference for a second straight season. . . . The Pats have two WHL championships to their credit — 1974, when they also won the Memorial Cup, and 1980. Regina last was in the WHL final in 1984. . . . The Thunderbirds have twice been to the final — 1997 and 2016 — but have yet to win it all. . . . The WHL final will feature a 2-3-2 format, opening with games in Regina on Friday and Saturday. . . . Portland freelancer Scott Sepich points out that seven of the last eight Western Conference champions have come from the U.S. Division, but only one of those — the 2012-13 Portland Winterhawks — won the Ed Chynoweth Cup. . . . This marks the first time either Regina or Seattle has been to back-to-back championship finals. . . . The Thunderbirds may open the final without F Keegan Kolesar, who was ejected from last night’s game in Kelowna with a checking-from-behind major at 16:08 of the first period. 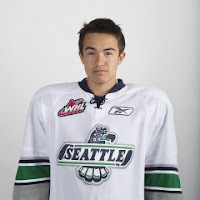 He plays on what arguably is the WHL’s top forward line, alongside F Ryan Gropp and F Mathew Barzal. . . . The championship final will be televised by Shaw. The WHL on Shaw will end a 13-season run with the final game of the series. A Sunday night note from Hartley Miller of 94.3 The Goat in Prince George updates the home-ice numbers to this date in the WHL and NHL playoffs. In the first round of the WHL playoffs, home teams were 22-22. That was 13-10 in the second round, then 6-6 in the third round, with the visiting team wrapping up both conference finals on Sunday. After three rounds, then, the home team is 41-38. In the NHL, the home team was 19-23 in the first round, and is 4-6 in the second round. Through 52 NHL games, then, the home team is 23-29. In the QMJHL, the Saint John Sea Dogs and Blainville-Boisbriand Armada will meet in the championship final. That series is scheduled to open Friday in Saint John. John Depourcq will be back for a sixth season as head coach of the junior B Summerland Steam of the Kootenay International Junior Hockey League. The team made the announcement on Sunday. . . . Mike Rigby, the director of player development and assistant GM for five seasons, has been named general manager. . . . Tim Hogg, the voice of the Steam, has more right here. year ago, the Thunderbirds lost to the Brandon Wheat Kings in five games. . . . Last night, the Rockets got off to a 1-0 lead at 15:57 of the first period when F Nolan Foote (2) scored a PP goal. . . . Seattle D Austin Strand (4) tied it at 4:56 of the second period. . . . Seattle went ahead at 9:30 when F Alexander True (8) scored his third goal in two games. this one came via the PP. . . . The game included a rarity in the second period when the Rockets had a goal disallowed because the puck struck referee Steve Papp on its way into the net. . . . Kelowna F Calvin Thurkauf put the puck in the Seattle net from a scrum, but Papp, in the area as he tried to track the puck, had the misfortune of having an arm get in the way. The veteran official immediately waved off the goal. . . . On the next shift, the Thunderbirds got insurance from F Mathew Barzal (5) at 15:14. . . . F Donovan Neuls had two assists for Seattle, with Barzal adding one. Barzal now is riding a 10-game point streak. . . . Seattle G Carl Stankowski stopped 17 shots as he ran his record to 12-2 in these playoffs. He moved into the starting role as the playoffs began when Rylan Toth, the team’s No. 1 goaltender through the regular season, was taken out by an undisclosed injury. . . . The Rockets got 19 saves from G Michael Herringer. . . . Seattle was 1-5 on the PP; Kelowna was 1-7. . . . The Thunderbirds lost F Keegan Kolesar at 16:08 of the first period when he was ejected with a checking-from-behind major for a hit on Kelowna D Devante Stephens, who didn’t return. The Rockets held a 1-0 lead at the time, but weren’t able to add to the lead on the five-minute PP, something that no doubt provided Seattle with some motivation. . . . The Rockets already were without D James Hilsendager, who was scratched with an undisclosed injury for a second straight game. As well, D Braydyn Chizen, who was injured in the second round, didn’t play a game in the conference final. . . . Seattle D Ethan Bear, with a soft cast on his left hand, took the pregame warmup for a second straight game, but was scratched for a third consecutive game. . . . F Dillon Hamaliuk, a 16-year-old from Red Deer, made his playoff debut with the Thunderbirds. A sixth-round pick in the 2015 WHL bantam draft, the 6-foot-1, 200-pounder had one goal in 17 early-season games with Seattle. He had finished up with the midget AAA Leduc, Alta., Oil Kings before rejoining Seattle. . . . Announced attendance: 5,846. . . . Andy Eide of 710 ESPN Seattle has a game story from the Thunderbirds’ perspective right here. . . . Larry Fisher of the Kelowna Daily Courier has a game story right here. Regina Pats have had two three-game winning streaks in the playoffs after trailing in a series. Chynoweth Cup. . . . Last night, the Pats erased 3-0 and 4-2 deficits, winning the game by scoring its last five goals. . . . The Hurricanes led 3-0 before the first period was nine minutes old. . . . F Egor Babenko (10) got it started at 1:43, with F Jordy Bellerive (7), on a PP, at 6:56, and F Ryan Vandervlis (8), also on a PP, at 8:02, upping the lead to 3-0. . . . The Pats cut the deficit to one on goals from F Robbie Holmes (2), at 8:25, and D Josh Mahura (4), at 10:46. . . . F Giorgio Estephan (11) scored on a PP, at 1:05 of the second period, to give the host team a 4-2 lead. . . . It was all Regina after that. . . . F Filip Ahl (4), on a PP, got the Pats to within a goal, at 15:47, and F Nick Henry (4) tied it at 17:20. . . . The Pats took the lead for the first time when F Jeff de Wit (4) scored at 8:41 of the third period. . . . F Austin Wagner (14) added insurance at 9:41, and F Wyatt Sloboshan (4) got the empty-netter at 19:19. . . . 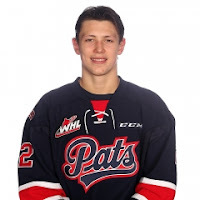 It says something about the Pats’ depth that they scored seven goals and their top two scorers, Adam Brooks and Sam Steel, combined for one assist, that by Brooks. . . . D Sergey Zborovskiy and Sloboshan each had two assists, with Ahl, de Wit and Mahura each adding one. Zborovskiy also was plus-5. . . . The Hurricanes got two assists from each of F Zak Zborosky and D Brennan Menell, with Babenko adding one to his goal. . . . This game feature the rarity of one player being awarded two penalty shots during the same stoppage of play. . . . With Regina leading 6-4 with 69 seconds left in the third period, Hurricanes F Tyler Wong was awarded a penalty shot because Pats D Connor Hobbs was ruled to have knocked the net off its moorings. Wong didn’t score on the attempt, but was given a redo when Regina G Tyler Brown knocked the net off during the penalty shot. On the second attempt, Wong missed the net. . . . Brown finished with 24 saves, 20 fewer than Lethbridge’s Stuart Skinner. . . . The Hurricanes were 3-3 on the PP; the Pats were 1-3. . . . The Hurricanes scratched, among others, F Matt Alfaro, who missed the entire series, and F Ryan Bowen. Lethbridge also was without F Josh Tarzwell, who scored his first playoff goal in Game 5 and left shortly after with and undisclosed injury. . . . Regina continues to play without F Jake Leschyshyn and D Dawson Davidson, both of whom have long-term injuries. . . . Announced attendance: 5,098. . . . Dale Woodard of the Lethbridge Herald has a game story right here. . . . Greg Harder of the Regina Leader-Post has a game story right here.